Portal update: Create task drafts on the fly! Today’s update extends the web portal with an important new feature. 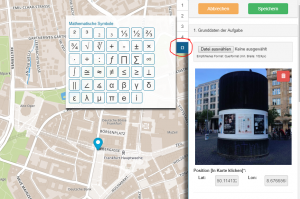 The mobile version of the portal (e.g. on mobile devices) now automatically starts in the so-called “draft mode”. 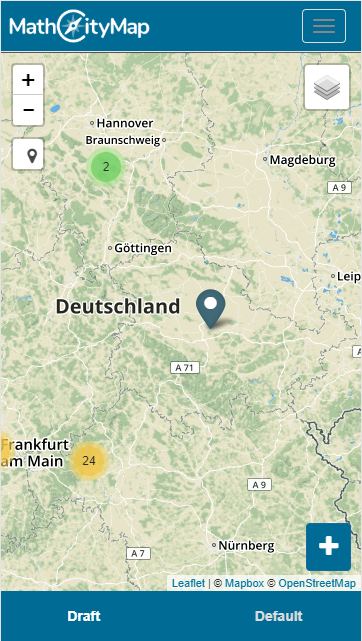 It is a reduced and light weight view that displays the map and a plus button at the bottom right hand corner. Clicking this button allows to quickly create a task draft. Just add a picture via your smartphone and click on the “Get position” button to automatically set your position. The task draft will be accessible in the “My tasks” area. This features allows users to quickly create a task draft while they are outside that can be polished and finished later on at home. 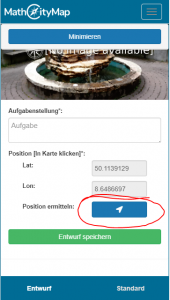 There is still the possibility to use all web portal functionalities on your mobile as well – just switch to “Default mode”. For more information take a look at the attached tutorial video. Added caching of tasks: Freshly created task will be cached. 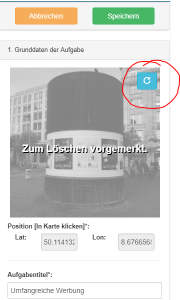 If a user closes the new task form by mistake, the task creation can be continued by clicking on “New task” > “Draft”. This behaviour should prevent data loss. 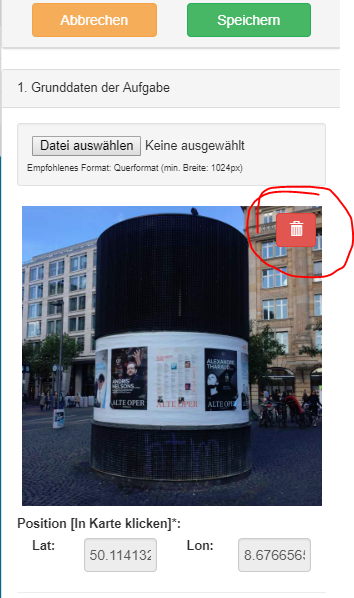 Added possibility to remove task images: Title images and sample solution images may now be marked for deletion by clicking on the “Trash”-icon of the according image while editing a task. 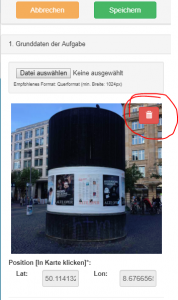 When the user saves the made changes, the marked images will be deleted (see image 4). Preparation for the ‘digital classroom’ and sub tasks: Made many backend changes and adjustment to prepare the web portal for the introduction of the ‘digital classroom’ and sub tasks that will be activated this year. Items that were shared by a group will be highlighted with the group name they come from inside the list view. Removed gamification option ‘Leaderboard’ from trails menu. This option will be available again in the ‘digital classroom’ feature. Fixed problems with decimal numbers in the task wizard in Internet Explorer and Firefox. Small bugfixes and style changes. 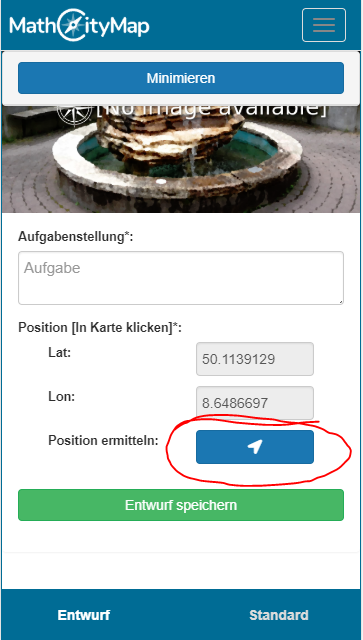 Eigene Position als Aufgabenposition festlegen.